What Makes WWII So Special? Belgium's history earned themselves the nickname, The Cockpit of Europe. From Julius Caesar to Hitler, it seems that somehow they would end up becoming a key battle ground for just about every war ever fought in Europe. Napoleon met his defeat at Waterloo and who can forget the bloody battles fought at Flanders during World War One? Belgium tried to stay out of WWII but Hitler invaded them anyway (10 May 1940) while on his way to France. Belgium tried to do what they did during the first world war, which was to hold the Germans back just long enough for Britain and France to respond. Although they were vastly out-numbered, they fought hard for eighteen days before having to surrender. However, the Belgians weren't completely done in. They did have troops stationed in their one colony, Belgian Congo. Known as Free Belgian Forces, they managed to scrape up 100,000 men to help their British allies. They helped them fight the Italians in East Africa, fought the Axis powers throughout Europe and their commandos fought the Japanese in Burma. They were able to furnish a couple of corvettes and a group of minesweepers for the Battle of the Atlantic. They also ended up providing two fighter squadrons to the RAF. 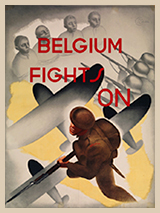 However, few people are aware of Belgium's contributions because they played a minor role in the war. 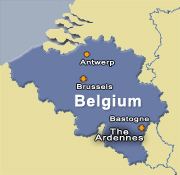 Belgium is best remembered as being the battle ground for the Battle of the Bulge. Every islander was faced with uncomfortable choices during the German occupation of Britain's Channel Islands. 38 remastered original recordings of that Miller sound that was like no other! The words "big band" and "swing music" mean Glenn Miller!